Welcome to the tenth edition of PuzzleNation Blog’s interview feature, 5 Questions! And I’m excited to have David L. Hoyt as our latest 5 Questions interviewee! Even if you don’t know David’s name, you’ve probably solved one of his puzzles. 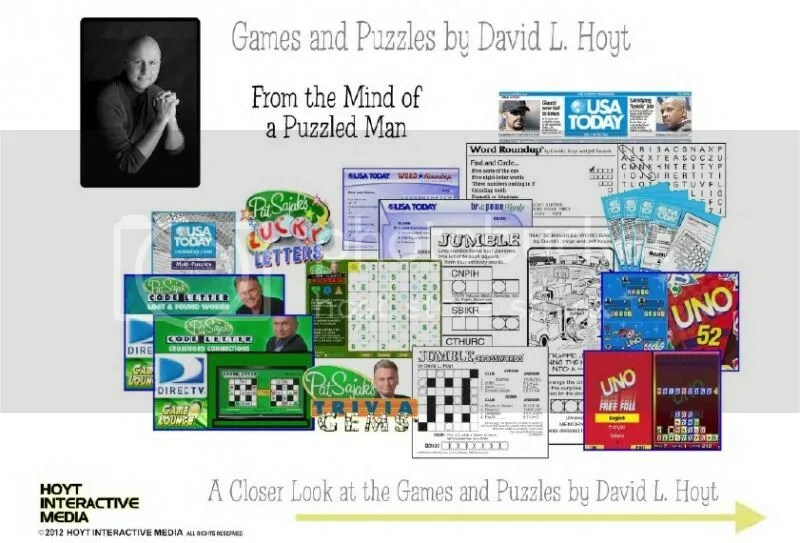 Whether it’s the illustrated Jumble puzzle syndicated in newspapers across America or one of his numerous puzzles and games, David Hoyt is a puzzle-creation dynamo. Seamlessly transitioning from print to electronic media, David also has a number of apps and websites featuring his work, cultivating terrific relationships with Pat Sajak and USA Today among many other brands. 1.) You’ve been recognized nationally and internationally as a leading name in puzzles for decades now. What, in your estimation, separates a great puzzle from an average one? It can’t be too easy, nor can it be too hard. It’s a balancing act. You want the solver to come back to play on a daily basis, so a great fast-playing daily puzzle will need to give the solver enough satisfaction and entertainment to get the solver back the next day. 2.) The internationally syndicated Jumble puzzle is probably the most well-known in your ever-expanding stable of puzzles. How many do you make in a year, and what does the creative process entail? I create the classic daily Jumble in partnership with cartoonist Jeff Knurek. I took over the reins from Mike Argirion three years ago. It’s in about 650 newspapers. It’s a seven-days-a-week puzzle. I also create Jumble Crosswords, TV Jumble and a few other Jumble-branded puzzles so the answer to how many I make is lots and lots! I really love making the classic Jumble. Coming up with the “punny” answer is so fun for me. I have found that I come up with the best ones when I’m running so quite often I’ll go for a run in downtown Chicago and just look around and listen for ideas. I love seeing how far I can run and how many Jumble ideas I can come up with during the run. The city of Chicago is my assistant when it comes to new puzzle ideas. 3.) The hundredth anniversary of the crossword is fast approaching. Given your familiarity with puzzles, what does the hundredth anniversary mean to you? Do you think puzzles as we know them will still be around a hundred years from now? I’m very excited about the 100th anniversary of the crossword puzzle! I feel very confident that puzzles as we know them will be around 100 years from now. I see enough young people playing puzzles on the trains, subways and buses here in Chicago that it makes me think that puzzles will be around for as long as humans are around. 4.) What’s next for David L. Hoyt? I have two things going on right now that have me super excited and that are laying the groundwork for a very busy 2014. I have a new hit game (app) called Just 2 Words and we are working on a series of new versions of this game for 2014. Also, I am working with teachers and students to get the Word Winder Giant Game into schools, libraries, etc. I love working with teachers and students. It looks like I’ll be spending a lot of time in schools in 2014 which I’m really looking forward to. I feel that an important key to success is to pay very close attention to the things that don’t work out the way you expect them to. I feel there’s much more to learn from things that don’t work out as expected compared to what you can learn from the things that do work out as expected. It’s ok to be wrong. It’s ok to have bad ideas. That’s just a part of being human. They key is to not let your human nature mask what really happened. There’s so much that can be learned from the non-successes that can lay a very strong foundation for success over the long-term. Many thanks to David for his time. You can check out his library of puzzles and games on his website, and keep your eyes peeled for his Word Winder game, as I suspect it’ll be finding its way into school curricula very soon! This entry was posted in Games, PuzzleNation, Puzzles and tagged 5 Questions, David Hoyt, David L. Hoyt, games, Geeking Out, interview, Jumble, Just 2 Words, Pop culture, PuzzleNation, syndicated, USA Today, Word Winder, Word Winder giant game by gmdirect. Bookmark the permalink.